Successfully Added Central Armrest Car DVD Player - 8 Inch Display, Region Free DVD Player, FM Transmitter, Built-In Speaker, Rotating Display to your Shopping Cart. 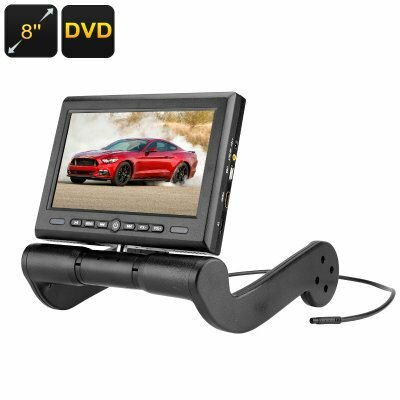 If you are looking for a way to keep your passengers entertained during your upcoming holiday or road trip, then this central armrest DVD player is the perfect car accessory for you! Coming with an adjustable foot, this car DVD player can be attached to nearly any car central armrest ranging between 160mm and 230mm in width. The beautiful display of this 8 Inch car DVD player delivers great visuals – letting all passengers in the back seat enjoy their favorite movies, series, and more in stunning beauty. Perfect for entertaining your kids or family while on the road – with this car media player time flies by and you’ll arrive at your next destination in no time. With its rotating display, you will be able to move the screen of this in-car DVD player in a 350-degree angle – assuring that no matter where in the car you’re seated, you’ll always enjoy a spot-on viewing angle. Its 800x600p resolution supports sophisticated color and detail, assuring a great media experience from the back of your car. Coming with its own built-in disc player, you will be able to throw in your favorite DVD and enjoy hours worth of entertainment while on the move. As a true high-end car DVD player, it is region free, meaning you can purchase new DVDs abroad without needing to worry about whether your disc player will be able to play it. Besides regular DVDs, this car media player also supports CD-R, VCD, and a TF card slot – bringing along an abundance of entertainment possibilities. This central armrest DVD player for in your car can be efficiently powered through your car cigarette lighter or its central battery, guaranteeing that you’ll always have an unlimited power supply to enjoy countless of the latest movies. Its 90dB built-in speakers deliver great sound. Additionally, its FM transmitter lets you sync your 8 Inch car DVD player to your central car stereo – allowing you to enjoy absolutely stunning audio quality. To increase your overall user experience even further, this car DVD player allows you to continue watching your movie where you left off before turning it down the previous time. Like this you’ll never have to spend time again on fast forwarding your movie, trying to find back the exact frame where you stopped watching last time. Additionally, it has a multi-language system that supports all the major languages out there. It furthermore comes with its own remote control, letting you browse through your car media player at ease. This armrest DVD player is the perfect easy-to-operate car accessory to keep your kids busy during your upcoming holidays, guaranteeing that you’ll never hear ''are we there yet?'' again. This central armrest DVD player comes with a 12 months warranty, brought to you by the leader in electronic devices as well as wholesale electronic gadgets..